En route to winning its first ever national team title indoors, the Arkansas women put together one of the fastest distance medley relay performance ever. Anchored by Dominique Scott, the Razorbacks clocked in at 10:51.89, missing the collegiate record by just one second. Scott (presumably) and her Arkansas teammates are back for the Drake Relays against some familiar competition. Both Baylor, which finished fourth, and Washington, which was fifth, are both scheduled to line up against the Razorbacks this weekend. Also in the field is Oklahoma State, which didn’t field a team at NCAAs but features on its roster two top-10 800-meter runners in No. 4 Kaela Edwards and No. 10 Savannah Camacho, as well as 2013 NCAA 1500-meter champion Natalja Piliusina, could make a run at the title. While it may be disappointing to not see defending outdoor 100-meter champion/indoor 200-meter champion Trayvon Bromell of Baylor and two-time defending indoor 60-meter hurdles champion Omar McLeod of Arkansas in their respective open events, the fun of a relay meet is that we’ll likely see them head-to-head in the relays. Both men are reportedly scheduled to run in the 4×100 relay, and – assuming both teams make it out of the prelims – could face off twice. Both squads are scheduled in the same prelim heat. Two more teams to watch: Mississippi and Oklahoma State, which will likely include their respective sprint studs Jalen Miller and John Teeters (who will square off in the open 100; more on that on the next page). 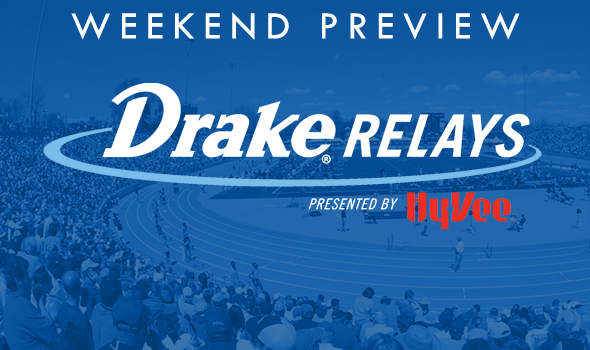 Of the 10 teams that finished this winter’s NCAA Indoor Championships 4×400 and weren’t disqualified, five will be in Des Moines for the Drake Relays. Headlining that group is runner-up Nebraska, which will square off with fourth-place Illinois, seventh-place Texas Tech, eighth-place Arkansas and ninth-place Ohio State. Another team to watch for is Baylor – a program with one of the best quarter-mile histories in the country – which has run faster than all of those teams (except Texas Tech) outdoors this year. Tech is No. 4 outdoors at 3:03.47, while Baylor is close behind at No. 5 in 3:05.26. Also, keep an eye on Georgia, which is ranked No. 10 this year outdoors. Three teams from the NCAA Indoor Championships final will be squaring off against one another this weekend in Des Moines. Boosted by NCAA indoor 800-meter champ Edward Kemboi, Iowa State was a surprise third-place after entering the meet as one of the last teams in. The Cyclones ran 9:32.48 for third. That’s well ahead of the other two squads from that race who will be at Drake: Arkansas was eighth in 9:40.83, and Oklahoma State was ninth in 9:47.78. During the regular season, however, those squads ran 9:28.37 and 9:30.65, respectively – faster than the 9:31.85 posted by Iowa State.